Meet upon arrival at Sheikh Hussein Bridge. After that, continue to the impressive Greco-Roman city of Jerash - one of the best preserved provincial Roman cities in the world with fortification walls, temples, baths, colonnaded streets, theatres, shops and sophisticated water works. The city is evidence of urban civilization spanning over a period of 9000 years including Hellenistic, Roman, Byzantine and early Islamic eras. Next, continue to Madaba, "The City of Mosaics", where we will explore the St. George Church of the 6th century A.D and view the Mosaics of the Holy Land Map. Aftera short drive, we arrive to Mount Nebo to retrace the steps of Moses and admire the spectacular view of the Promised Land just as he did over 2,000 year before. It is very easy to feel that you have arrived some place special. On a clear day Jerusalem, Jericho and the Dead Sea can be seen. A memorial in Moses’ honor can be found at the entrance to the early Byzantine Christian church where Moses is believed to have died. We then continue to Petra for dinner and overnight at Amra Palace 3* hotel or similar. Breakfast at the hotel, then the guide will meet you to start the Petra visit. Upon arrival at the Petra Visitor's Center, the guide will arrange your entry then start exploring the main attractions of the lower part of the city starting from the main gate all the way through the kilometer-long Siq to visit the Treasury, Street of Facades, the Theatre, all the way down to the Nympheom and Qaser El- Bent. Continue on a self-guided hike to the Monastery or the High Place of Sacrifice. The Monastery can be reached after a steep climb of 800 steps. This impressive structure is the largest of the rock-cut facades and so large that the door itself is bigger than a house. The High Place of Sacrifice thought to be the holiest site of the Nabataeans and is one of the most thrilling walks in Petra. 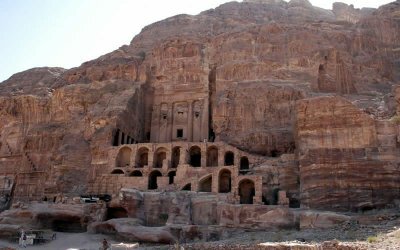 Climb up the steep steps of the ancient route with its wide views over the monuments of the Petra basin. Pass beautifully carved tombs and monuments and marvel at the work involved in creating this ancient site. After, return to the main gate and meet our driver who will transfer you to Amman Airport for departure.